When the Redskins have the ball: It took two weeks to see the peaks and valleys of this offense and rookie quarterback Robert Griffin III. After winning Offensive Player of the Week honors (the first time a rookie QB ever accomplished the feat) following the season-opening victory over the Saints, RGIII looked slightly more human in last Sunday's loss to the Rams. That said, if being a mortal means he still completes 69 percent of his throws (he managed 73 percent in Week 1), that's light years ahead of what anybody ever expected from Rex Grossman and/or John Beck a year ago (or Donovan McNabb ever). But Griffin took a beating, too. Partly because he held the ball too long (something that plagued him in the preseason) but also due to some shady tactics by the Rams that went uncalled. Either way, spending the afternoon on your back can make for a short career. RGIII will get better but he'll need help, namely from his pass catchers, particularly if wideout Pierre Garcon is sidelined for the second straight week. If nothing else, it'll provide Josh Morgan a chance to redeem himself after a personal-foul penalty effectively put the Redskins out field-goal range late against the Rams. Morgan's momentary lapse in judgment led to death threats on Twitter, something that he's using as motivation. "You never let it get to you, especially with me being from DC," he said via the team's website. "That was therapeutic because for them to put everything on me and let me know I can’t do anything like that anymore. "Every play I make from now on is going to mean something. If that play meant the whole game, than every play I make from now on will mean something. It just put a lot of pressure on me to keep doing what I do, helping the team win." The Bengals are 1-1 but haven't played particularly well. They were smoked by the Ravens in Week 1, and beat a hapless Browns outfit last Sunday. And defensive coordinator Mike Zimmer has been unimpressed with his unit. The Bengals allowed the Browns to rack up 439 yards of offense, and the 617 net passing yards over the first two games set a team record for ineptitude. So there will be opportunities for the Redskins to move the ball. They'll just need to minimize miscues, starting with silly unsportsmanlike-conduct penalties. When the Bengals have the ball. One of the biggest knocks against the Daniel Snyder-era Redskins is that the organization eschewed depth for big names. Invariably, this strategy failed. But things have been different in recent years and we'll see Sunday how well coach Mike Shanahan and general manager Bruce Allen have put together this roster. 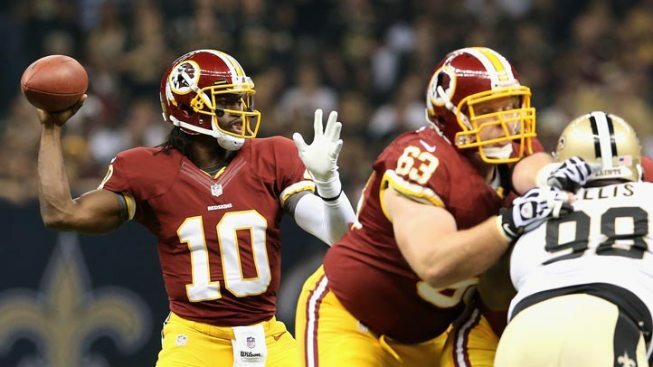 With Adam Carriker and Brian Orakpo done for the season others will have to step up. And it sounds like second-year linebacker (and former first-round pick) Ryan Kerrigan is ready to fill that leadership role as well. The Bengals will likely test the Skins' revamped front seven with heavy doses of running back BenJarvus Green-Ellis, and if that doesn't work expect them to test the secondary with A.J. Green, one of the league's best wideouts. But Kerrigan knows he has to be at his best to avoid big plays from Cincy's offense..
X Factor: We thought it went without saying, but apparently not: kicker Billy Cundiff is 4-for-4 this season on kicks inside 50 yards. He's 0-for-1 on 62-yarders. The lesson: avoid silly penalties that force Cundiff to attempt field goals from beyond 50 yards.